While those in the mainstream media blame Trump’s inflammatory “fake news” rhetoricfor half a dozen bombs mailed to prominent Democrats and CNN, the New York Times ran a short story envisioning Trump’s assassination. The story detailed a failed assassination attempt by a Russian but what happened next was incredibly disturbing. Frustrated by the failure of the Mueller investigation to turn up the requested dirt on their “enemy”, Trump, the media “resistance” asked a few spy novelists to predict a more “appealing future” for the president in the Times‘ literary supplement., according to RT. The results revealed some shoddy writing work, even putting aside their predictable endings. Spoiler alert: Trump was colluding with the Russians all along! The story is typical leftist fantasy garbage: violence, death, and permanently silencing those with whom they disagree. This is a highly hypocritical stance for the mainstream media to take. 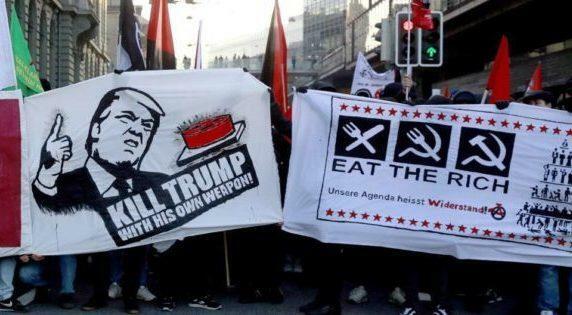 On the one hand, they demand Trump cool down his rhetoric toward them, but on the other hand, they insist on publishing violent leftist trash meant to incite glee over the president’s assassination. New York Times: Be sure to read the story we published depicting Trump getting assassinated. New York Times: We need to have a serious conversation about Trump’s rhetoric. If you think the media is not inciting violence, just take a quick look at an article by Breitbart titled, 613 Acts of Media-Approved Violence and Harassment Against Trump Supporters. The 2018 elections have been marked by vicious rhetorical attacks. Hillary Clinton, Eric Holder, and Maxine Waters have all been accused of calling for their supporters to physically attack GOP candidates and their voters. Several candidates actually have been attacked in the last month, and one man was arrested for mailing ricin to the White House and Pentagon.